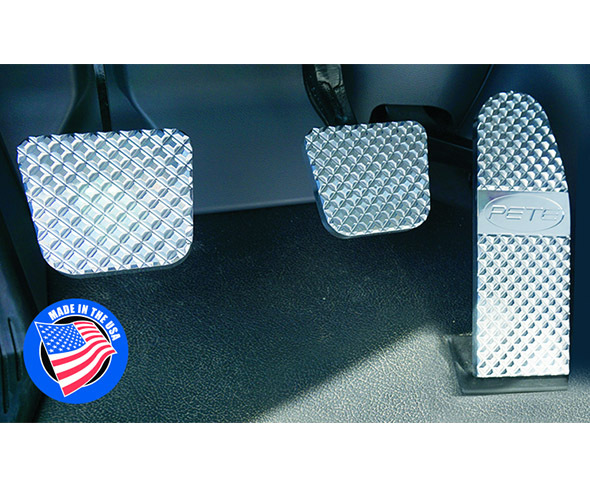 The Ultimate Pedal Upgrade for Peterbilt, Kenworth and Freightliner – There are no other pedals on the market that come close to these custom high-quality heavy truck pedals. Custom pyramid-cut diamond pattern reflects light in all directions and offers an unbelievable non-slip surface. Also available with a durable black finish with pyramid-cut diamond pattern polished highlights. Solid billet aluminum precision machined and then polished by hand. Easily installed. Call 800-982-1180 or visit www.realwheels.com for our new 32-page catalog.